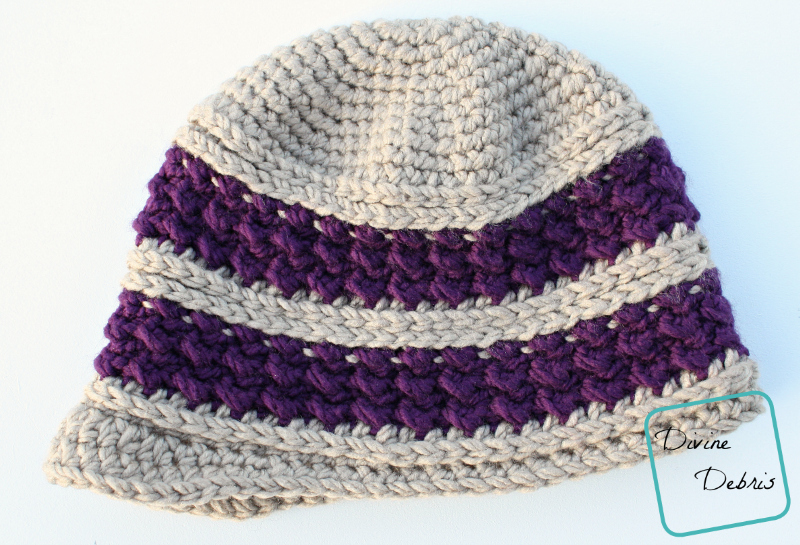 So, with a couple of lovely colors I decided to do a pattern that I’ve been wanting to for a while, a newsboy hat. Better yet, the lovely Diana Line was going to show off how great bulky yarn can be. I don’t even know why I was so intimidated by it for so long. Perhaps I’ll buy some super bulky yarn next and let inspiration show up. Please be sure to sign up for e-mails on the left. And I’m always looking for new testers, sign up to be a tester for me here. You will have to know how to work into the back third loop of a hdc for this pattern. This hat is worked in 2 parts: the Body and the Brim. The Body is worked from the top down in the round with a slip st at the end of the rnd into the first stitch of that same rnd, the Brim is worked back and forth in rows. There are turns on only SOME rnds. The ch 1 at the beginning of the rnds does not count as a stitch. For the child size, work rnds 1 – 8, skip rnd 9 and the work rnds 10 – 26. In the photos: color A is taupe and color B is the dark purple (both Loops and Threads Charisma). This hat wears big and cozy. If you feel like you’d like a tighter hat, remove an increase or follow a chart to know when to stop increasing based on your needs. For child size of this do not do rnd 9, just move on to row 10. Fasten off both colors, weave in all your ends. Tada! So what do you think of my new Diana Newsboy Hat? I Hope you love it as much as I do! This post is linked to Hookin’ on Hump Day #106, Oombawka Design’s Link and Share Wednesday #117, Linky Ladies’ Community Link Party #24, Yarn Fanatic Party #53, Lunamon Design’s Two Day Link Party #45, Rebeckah’s Treasures Saturday Link Party #20, & Fiber Tuesdays. Beautiful. Thank you for sharing at my link up last week. New party is now open. I’m a knitter so I’m going to have to ask my sister to crochet this one for me. I just love the style of the hat! 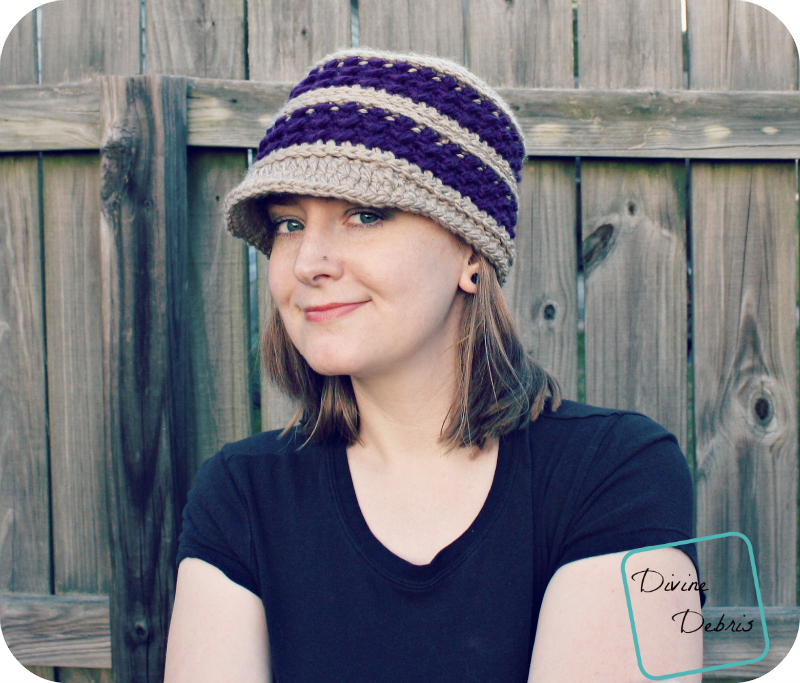 Made this hat and loved it! Thanks for the easy to follow pattern! Did you share photos on Ravelry or IG with the tag #DivineDebris? I’d love to see them! Hi at row 13 I have turned my work and seem to be working back loop inside the hat is this correct? Yes, rows 13 through 17, and again on rows 20 – 24, you turn your work and will be working with the inside of the hat facing you. Just be sure that you do the correct amount of turns or you will have some of the pattern backward. Yes, you turn every row. In that section your hdc-ing into the slip st spaces and slip st- into the hdc spaces and so you need to turn the work for that to work out right. Are you using the yarn I’m using in the pattern? Did you check your gauge? What size did it end up? If you want to make the hat bigger it’s very easy, just add another increase or as many as you need to the top of the hat. In the pattern I stop increasing after row 9 for the adult size, but you can always add more to make it larger. You will have more stitches but you can just add more repeats of the * to * part of the pattern when you get to the sides. The brim might be tricky, but you could add more to the 21 hdcs in the center to make it larger. Hi thanks for the advice. Made a larger hat, when attaching yarn for the brim should the right side be facing me? Hi! Yes, the right side should be facing you. Oh, I’m so glad! I love this hat, it’s cozy and warm, 2 of my favorite things to have on my head in the Winter. 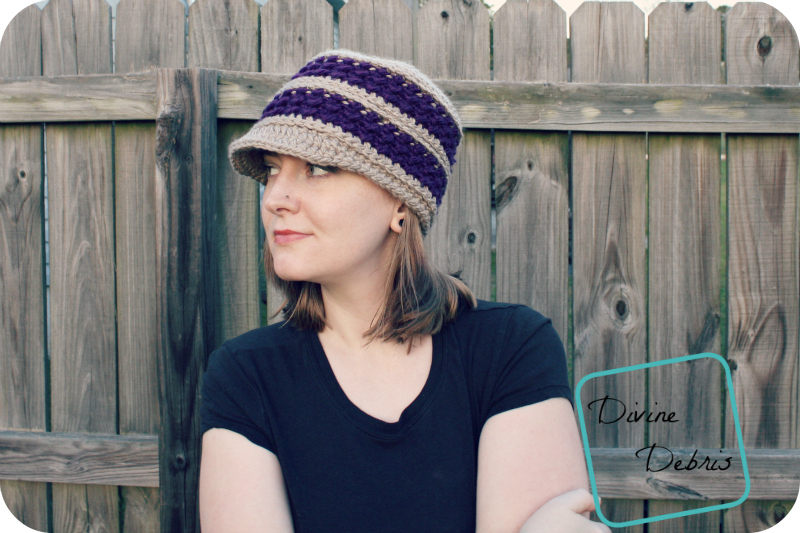 Pingback: Yarn Fanatic Party #54 – Week 1 – Happily Hooked Magazine & Haven for Hands Giveaway! Hi, I’m starting row 13 on this hat. The “B” is confusing. Is there a row 13 “A”? The A and B designations refer to the colors (the notes say which colors are A and B in the photos). You begin with color A on Rnd 1 and change to color B on Rnd 13.